Mr. Hermann is a member of the Commercial Litigation practice group. A highly experienced litigator and advisor, Mr. Hermann has taken on a wide range of complex disputes. Mr. Hermann has handled litigations in federal and states courts, both trial and appellate, representing Fortune 500 companies, banks, businesses, insurers, not-for-profits, government entities and individuals. He has also represented municipalities, school districts and universities in civil and property rights and administrative law disputes. 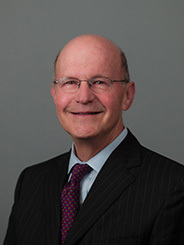 He has overseen federal and state governmental investigations and regulatory matters, financial services and securities industry contests representing the government and, subsequently, corporate clients and industry associations. Mr. Hermann has done trial and appellate work in federal and state courts, including arbitration. He has argued numerous appeals in state and federal courts in New York including the United States Supreme Court. In addition, Mr. Hermann has broad experience in New York State government as a lawyer and policy adviser. He was Special Counsel to the New York State Senate Majority; Director of the New York Governor’s Office of Regulatory Reform; Solicitor General for the State of New York; and Chief of the Public Advocacy Division of the New York Attorney General’s Office.